Anyone know if and when the popcorn buckets and mugs are going to be out?? I want them so bad. 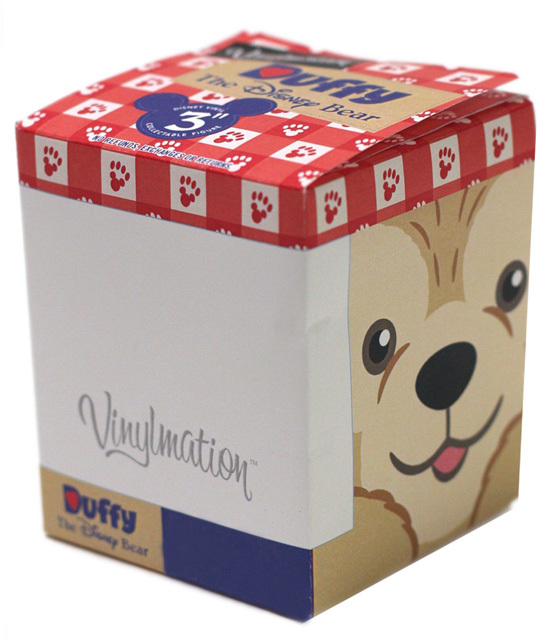 The Disney Parks Blog has posted an update on Duffy Merchandise. Can't wait for this pin set coming out in June!! Yeah, VINYLMATION!!! It won't come out until next year though! Here is a sneek peak: I wonder if these will be OPEN WINDOW vinyl or Surprise (don't know which one you are getting vinyls). Also, the CARS outfit is being released SOON!! Just in time for Cars 2! My friend sent me a picture of him wearing the Duffy hat at Epcot today, he was so excited! I bought the French Outfit today and I love it! Note how one side of the beret goes through the ear. The hat holder ring thingy on the hats is only on one side on this hat. The kilt will have to wait till later. Has any one had any problems with staining of the fur? I am worried about that and its keeping me from wanting to even use the costumes I have gotten from DCA. They replied to someone asking on the blog saying it will be Open Window and not surprise The window will be where the white block is. Someone also asked if any of the Japan stuff may come over and that was essentially a no, right now, though, things "inspired" by them may be made. FYI, the Duffy earhats are available at Once Upon a Toy and World of Disney at DTD at WDW. I picked up a pair yesterday (along with an Easter Duffy, a "regular" Duffy for my mom & 2 sailor suits). 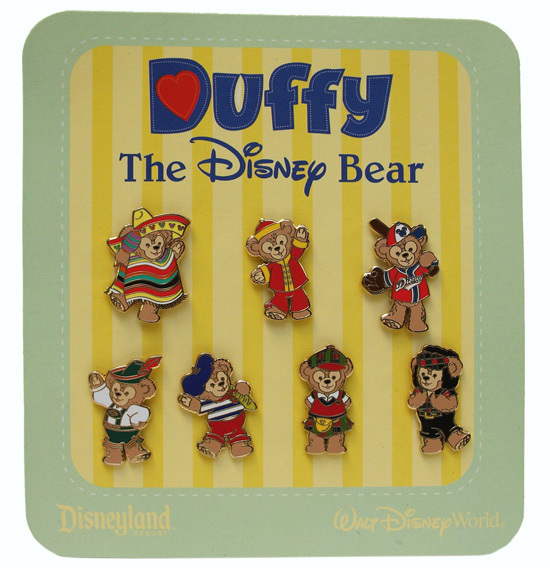 I spent almost $100 on Duffy swag in one fell swoop! I have the same thoughts, but I'm optimistic. It really does seem like they are more committed to his success than I first suspected. As long as they keep adding to the product lines, I feel confident Duffy is already finding his US and global audience. You and me both! That pin set is so good that it almost makes me like the actual costumes more! I have the same feeling, Janell. I think it's cos they're doing really cute/interesting things with the ear positions. 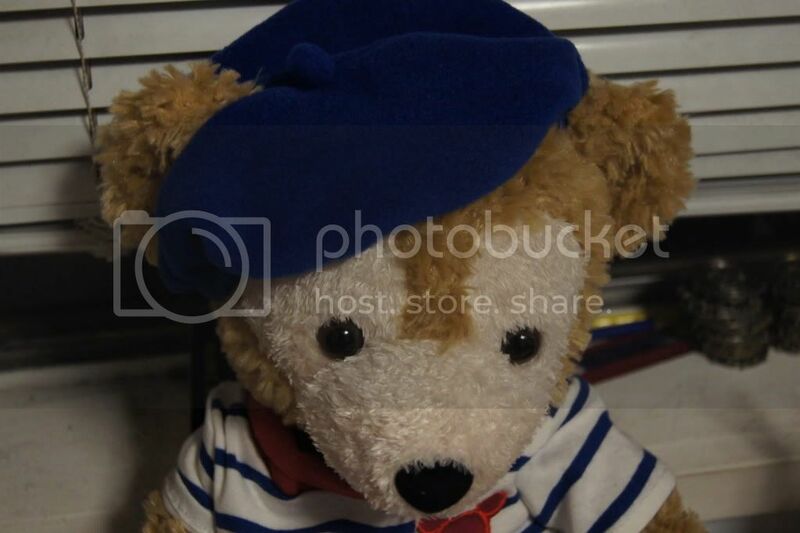 That beret is MUCH cuter now that I see it has an earhole; I'd actually like to have it now! Nice one, Disney Parks! I have had no problems with the costumes staining Duffy's fur. I have the Canada, Germany, France, Mexico, and China outfits. I have my Duffys in all of those costumes and none of them have stained his fur. BTW, the Duffy store at Epcot is sold out of the hats still but Mouse Gear and the little shop in the back enterance between France and UK leading to the Epcot resorts have the hats. Haha I thought it was funny how he said the ear hats are coming out early may when they've been out for awhile now! LOL! I can't wait for the vinylmation! It will be the one and only time I'll actually get one! And I really hope the design team really is learning their lesson. I can see some people who commented on the blog are asking for TDS stuff, and I think it's greatthat he responded the way he did. Maybe inspired by could be the construction and materials used. They are seeing more and more fans everyday, and maybe that will motivate them to go the TDS route and start creating lavishly detailed costumes! Here's hoping! I'm super excited for this year! I feel like its going to be filled with Duffy! I'm definitely going to be picking up the French outfit when I get the chance! And like Steve said on the blog, the Duffy facebook page has a huge amount of followers! Almost 30,000!! That's ways more than the vinylmation page!!! I know you also offer to sell some here which is super nice of you! Just considering I'm such a lurker (despite how long I've been here), I haven't had courage to order anything since I still feel new in a way. @-@ Like I shouldn't. But getting back to the subject, I personally feel bad everytime I browse through Yahoo!Japan and see all these US outfits up for overpriced with bids But I'm guessing they won't get those over there either. Last edited by Wondering; 04-09-2011, 01:11 PM. I too am excited for the years to come with Duffy and what Disney does with him. They are increasing his influence more and more. Recently at the parks I saw quite a few people with Duffy items, and when Duffy came out for a meet and greet a good amount of people flocked to him with smiles on their faces. Although while in the Duffy store I overheard a woman say "Who's Duffy?" 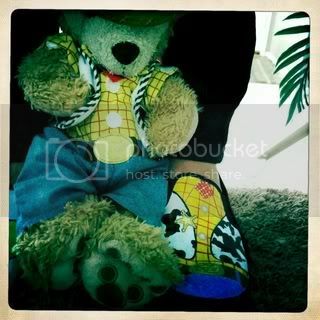 and her daughter said "Some bear you dress up.. it's like a ripoff Build a Bear." I honestly wanted to interrupt them and explain what Duffy was really about. I guess some people just aren't getting it yet. 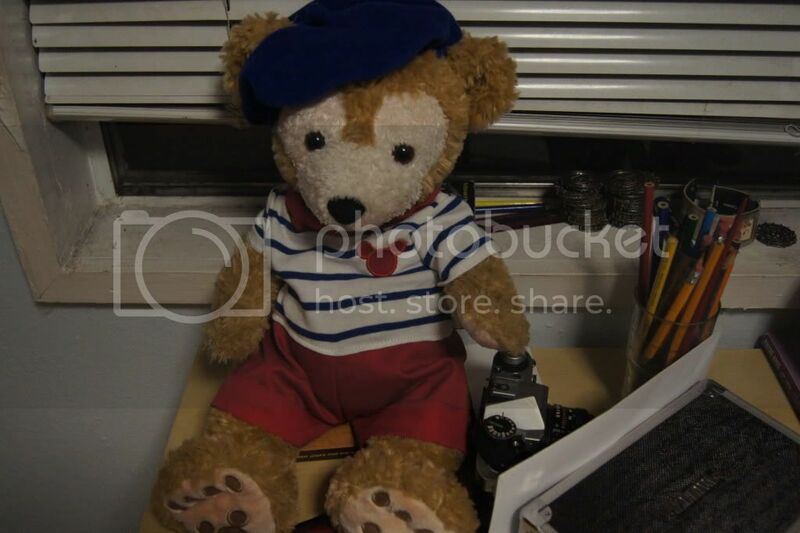 I have faith that Disney will keep doing great things with Duffy and really get the concept out to people. Disney Parks Blog features are good for a start - lots of people read that! The thing with Build a Bear was the fact that you could get your own plushie stuffed--that was the special thing about it. Not the clothes. While seeing plushies with outfit sets were kind of rare until then (Build a Bear made it popular), there WERE plushies with outfit sets before that and other dolls and things had stuff like this -way before- Build a Bear even existed.